Cut, stick, glue! My scrapbooking son. We are currently working its way through one large Pritt Stick a week. It seems that scrapbooking is the activity of the moment. DorkySon follows me around the house, chanting “Cut, stick, glue! Cut, stick, glue! Cut, stick, glue!” until I finally give in and sit down with him at the table, a tower of magazines in front of us. I suspect it may be in his genes, as I spent ridiculous amounts of time and money doing the same thing as a teenager. But while I filled my scrapbooks up with pictures of boybands, carefully cut out from Smash Hits, DorkySon’s tastes are a little more highbrow. So far he has shredded the entire collection of Lonely Planet magazines that were my birthday present last year. We have to hide the Saturday and Sunday supplements until we’ve read them; otherwise they end up in pieces across the living room floor. Last week I even found myself buying a copy of Top Gear magazine, because I knew it’d have enough pictures of cars to keep DorkySon happy for a whole afternoon. The only publications he won’t cut up are his own Peppa Pig and Bob the Builder magazines… funny that. 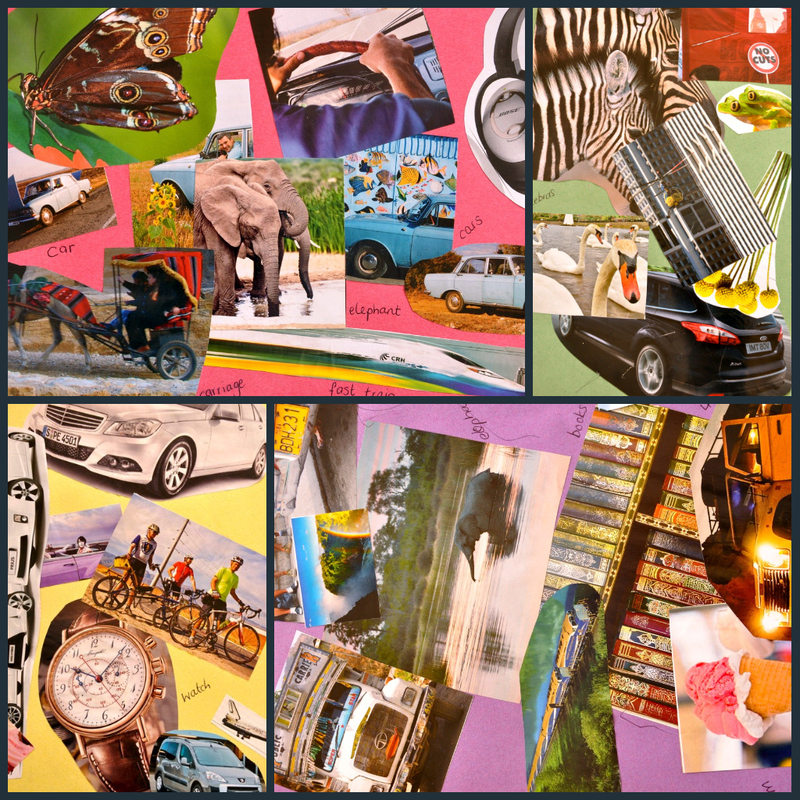 When I started this blog, I considered calling it ‘Seven Cars and a Kitten’ because the first time DorkySon ever made a collage, that’s what it contained; I loved the odd juxtaposition of things he liked. Several months later, the pictures that he chooses to cut out and stick in his scrapbook remain a lovely insight into what makes him tick. Some of it is very predictable. There are an awful lot of cars… not to mention buses, lorries, motorbikes, aeroplanes and trains. He doesn’t seem too fussed about boats, perhaps because he hasn’t yet been in one. There are also a lot of foodie pictures. They’re mainly adverts for chocolate bars, cakes and ice cream, but he’s also stuck in a couple of stir-frys and roasts from the pages of the Observer Food Monthly. There are some surprising inclusions though: an odd collection of pictures, which for one reason or another seem to have appealed to him. There’s a wheelbarrow, the entrance hall to the British Museum, and a picture of Barack Obama. A banner from an Anti-Cuts demo has been Pritt-Sticked in right beside a pink Jimmy Choo and an old Roberts radio. I’m pleased to see there is only one woman in a bikini, and he has covered up her lower half with a Shetland pony. Irritating though it can be to have the floor littered with tiny scraps of paper, and the newspaper ripped in half before I’ve read it, I’m thrilled that DorkySon is having fun with his scrapbook. His first book is now completely full, so we are working our way through it and writing labels on the pictures to explain what they are. It is doing amazing things for his vocabulary (we are no longer allowed to talk about ‘diggers’ – he insists that we differentiate between excavators and back-hoe loaders…) and it is a pretty cheap and easy form of entertainment. Now we just need to find something suitable for starting DorkySon’s Scrapbook Volume 2, and I need to persuade him that it’s okay to cut up his own magazines, as well as mine. Peppa Pig beware, your days are numbered. Thank you so much! Just a wee collage of 4 pages from his book!